Nagra reels 564A - 566A and 1150B - 1155B. a 'Lady Madonna' jam and two performances of 'Oh! Darling'. Apparently, only 'Lady Madonna' was caught on the 8 track (E90523). Examination of the Nagra reels reveals many more false starts and breakdowns than this tape box or Barrett's notes would indicate. This makes it difficult to determine exactly which performances and what extraneous material is on this reel. "Are we supposed to giggle in the solo?" The tape box indicates that take 25 is a false start. However, Lewisohn implies that it was complete. Take 25b is complete. Includes a couple false starts prior to the performance. "I've lost me little paper"
"Take 27 sync the second clap"
"Sync the second clap, please"
There are two full performances after the take 27 call. Take 27a was the basis for all official releases. Take 27b is seen in the "Let It Be" movie. The entire performance listed above is heard on Nagra reels 565A - 566A and 1152B - 1153B and can be heard on Yellow Dog Records' "Day By Day" series. There are no playbacks for any of the performances. On 30 April 1969 a new lead guitar was added to take 27. This and the extraneous comments were was used on both variations of Glyn Johns' "Get Back" album and are made available from reel AR14271/2 LP "GET BACK" STEREO LP 2 June 1969 and a John Barrett cassette dub of AR16991/2 "GET BACK" STEREO LP (DO NOT USE FOR MASTERING) 5 January 1970. These are available on the various releases of both variation of the "Get Back" album. An acetate that sounds like the single mix can be found on "Acetates Collection" from Unicorn records. 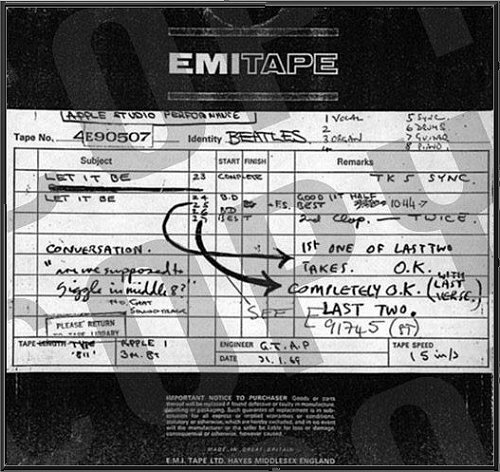 This can be seen in the "Let It Be" movie with audio sourced from the Nagra reel. This was mixed in 2003 for "Let It Be...Naked". The bulk of the mix is take 27a. The middle 8 is from take 27b. The mix also features the later overdubs. For further info, see reel E91745.